Joseph, an intrepid ginger tomcat, fell in the sea from the mizzen channels, heroically paddled around the Pacific for 20 minutes, and punched a predatory albatross with a paw before finally being rescued in this nail-biter from Alan Villers. “On the second Friday the twenty-second of May  Joseph, the ginger tomcat, fell in the sea from the mizzen channels, and we hove-to and went back for him. 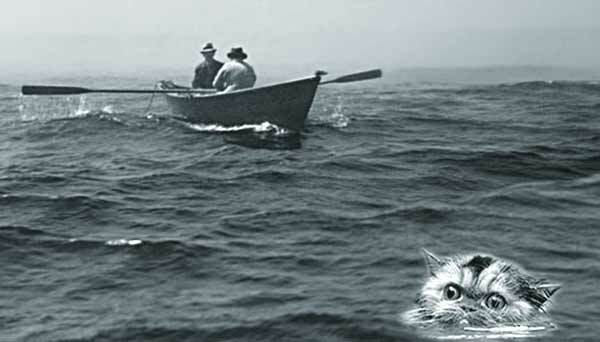 Joseph was a good cat; we could not leave him to drown. A broad plank that projects horizontally from a sailing ship’s sides near its mizzen, or third, mast. 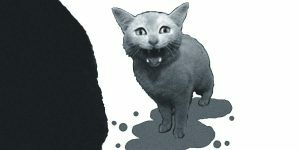 “Joseph had come aboard with his brother Conrad from the plantation at Berande, on Guadalcanal in the Solomons, some months before, as a very little kitten. The brothers took happily to sea life, having known very little of any other, and rapidly became favourites on board. One of their chief delights was to climb the rigging, and at this the ginger one, Joseph, was especially good. He was accustomed to mount to the maintop each morning, springing gaily up the shrouds, and from that height surveying imperiously what he regarded as his domain. When that palled, he would play on the boat covers or leap on to the cover of the dinghy, which was carried outboard on the port quarter davits as an emergency boat. He was a surefooted little beast and often sat for hours in the channels, provided no water broke there, staring into the sea. He appeared at a loss to understand where so much water could come from. 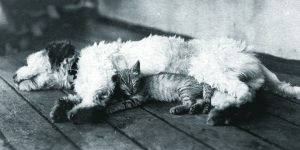 “On this morning, which was cold with squalls – for we were two degrees south of forty then, in the west winds zone – he took a leap from the dinghy cover on to the top of the hammock netting, but the ship rolled heavily and though one small paw found its objective, the others did not and he slipped into the sea. 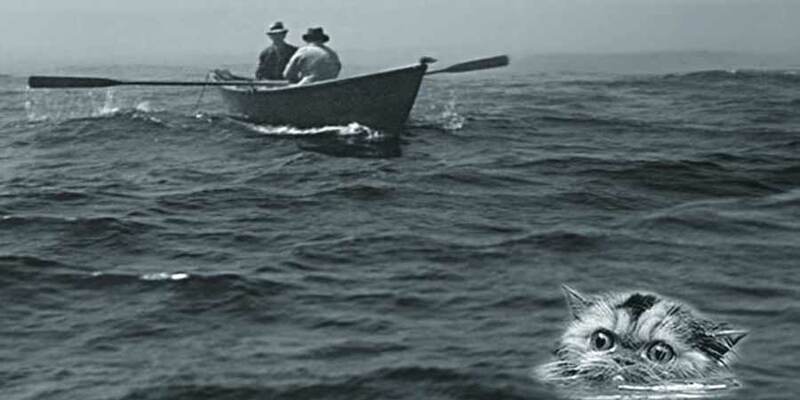 Here he at once began, very strongly, to swim, looking up only to give a surprised meow. But he had been seen. “It was a fresh wind with quite a sloppy sea. I ordered the helm down at once and backed the main yard. The dinghy was put out in a few seconds, being always ready for just such a service, and two of the best seamen took their places at the oars. These were the sailmaker, Karl Sperling, and the able seaman, Hilgard Pannes, Both veterans from the Parma. The last glimpse I had of poor Joseph was when an inquiring albatross, which had been gliding around, came down near him to examine this strange object, but the cat lifted a ginger paw and smote his visitor heartily over the nose, whereupon the startled albatross at once took off again and left him alone. 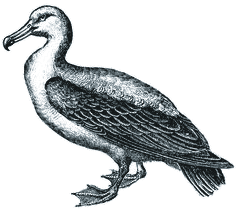 The beak of an albatross would have made short work of poor Joseph! He knew that; but he was not one to be afraid. 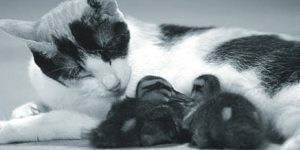 I could not leave a cat like that to drown. 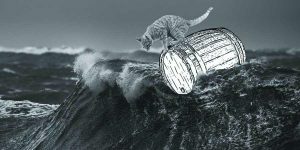 “It seemed utterly impossible to find a tiny cat in all that waste of water, for a ship, even hove to, was still drifting, and the cat was so small. Still, Hilgard and Karl pulled back toward the place where they thought he might be, while many eyes in the rigging kept look-out on the sea for the tiny form. We did not see him again. But I had a rough bearing of where he was and in this direction the dinghy pulled. 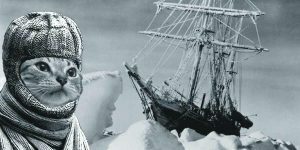 They were about to give up, after pulling for twenty minutes and searching all the area within two cables of the ship, when, to the astonishment of all hands, there was Joseph, wet and bedraggled, weakly swimming towards the dinghy.